The last couple of weeks I’ve been struggling. I haven’t been sleeping well. I have had trouble focusing in class and with my clients. (I’m in graduate school working towards my degree in counseling) I’d rather lie around all day watching tv than get anything accomplished. I was starting to recognize the funk I was in as depression. I’ve been trying to shake it. I thought I just needed to get myself organized and then I’d be able to focus again. I switched internships a few weeks ago and I thought the schedule change was contributing to my funk. Then I thought I needed to get the paperwork organized so I had an idea of what I was doing. I looked at him and I said I have 4. Both of my boys birthdays, the accident date and Christmas all fall within the same 3 month period. December – February. After 4 years you’d think I would recognize the signs that I’m entering the hardest time of the year for me. But no, it didn’t even dawn on me. It took an outside observer for me to realize that my “funk” was really about the boys. As I talked to my supervisor I admitted something I haven’t been willing to admit to myself or anyone else. I haven’t been allowing the pain in. I know I desperately need to, but I just don’t want to. I’m so tired of hurting. I’m so tired of the intense pain. This year has been the hardest year since that first year. The cloud of the surreal is lifting and the reality is really setting in. The last few years my life has been separated into 2 worlds. The reality I’m living and the dream of my old life. Most of the time the life I’m living now feels like it’s the life I’ve always lived. And the life with the boys feels like a dream. Every now and then that barrier would be crossed and I’d feel the pain of what I’ve lost. But eventually the barrier would go back and I could continue to carry on. This is all so hard to explain, but so normal in the grief process. This year has been different. The dream of my old life and the reality of my new life have been trying to merge into 1 reality. And I’m afraid. I’m afraid to let the pain in, because I know that this time the protective barrier isn’t coming back. The reality that my boys are truly gone is setting in with a finality that I don’t want to deal with yet. Yes I will admit it . . . I am afraid. I know how intense the pain of grief is, and how exhausting it is. It’s sitting at a stop sign and realizing it hurts so much you have stopped breathing. It’s the sharp, searing hot pain that slices through your heart when you weren’t expecting it. It’s the dull ache in your heart from not being able to hold your child anymore. It’s collapsing to the floor of the boy’s room because your legs will no longer support your weight. It’s crying so hard you cannot breathe. It’s feeling alone even when you are in a room surrounded by friends and family. I wish I could fully explain the depth of the pain and grief that comes with losing a child. But unless you’ve experienced it, you can never really fully understand. And that’s good; I wish people didn’t have to know this pain. I hope you never have to. C.S. 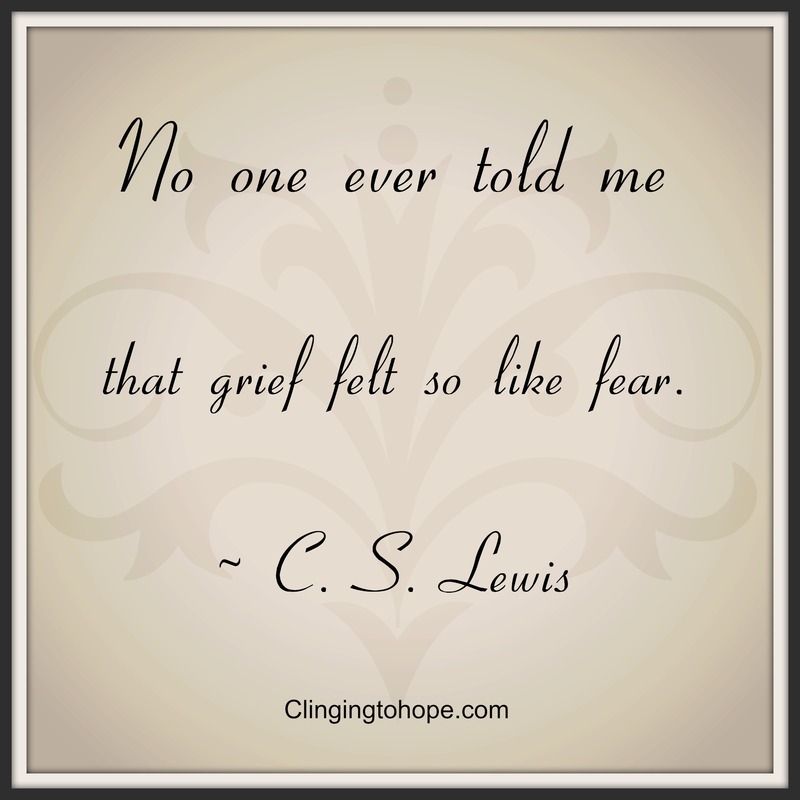 Lewis is right; grief and fear are incredibly linked. The fear comes from knowing the pain is intense and cannot be avoided. It has to be dealt with. Grief cannot be ignored, it will come out eventually. I know I need to let the pain in, or as I like to put it, have a meltdown. And I will. I cried while writing this post, and that’s a step in the right direction. I may have to deal with this in small bits instead of my normal big meltdown. Or I may need to have a full on crying fit. Either way, I need to make time in my life to grieve. These next few months are going to be hard and I need to allow that into my life. The only way through grief is to deal with it head on. And I will, when I am able to. Another huge tear jerker. Such terrific insight. I remember one day at work when I was just out on recess duty and crying my eyes out. I had no idea why, until later I realized it was our son’s birthday. Why that time of day set me off I don’t know unless I had a glimpse of what he would have looked like. Who knows? It just overcomes you. You must be touching many people with your blog. Prayers for you over the next few months especially. Thank you Carol! Its so strange how our body remembers even when we don’t. For the first few years after Molly died, I attended lots of grief meetings. Then for various reasons there were periods when I didn’t go. Last night the topic was “getting through the holidays” and I remembered how desperately I looked for help my first Christmas. As a more “seasoned” griever with six years of experience, I wanted to be there to support others. At the meeting we talked about how the grief journey is like climbing out of a deep bowl or canyon. In the beginning you are at the very bottom. You gradually work your way toward the top rim, but there are many factors that effect your climb. We all deal with grief in our own way. There are ledges where we get stuck at times. We may need to rest there awhile when the pain is too much to bear. We may need more time to cry, read books, write about our pain, attend grief support groups, etc. Early on there are most likely many slips that take us crashing to the bottom again, but over the years we work our way closer to the rim. We still have those difficult anniversaries or events that that cause us to slide down the side of that bowl, but we don’t slide down as far or as often. At The Compassionate Friends meeting last night we had about 35 people. It was like we were all on various ledges, together in that huge bowl of grief, compassionate friends giving each other strength and hope to make the journey upward. I think it is great that you are sharing your insights as you work through the intense pain of losing your children. Those of us who must take this journey, need traveling companions who can understand and honor our needs. Even in our somewhat exclusive group of bereaved parents, each of us has his own unique way of not only surviving, but hopefully thriving once again……..perhaps living mostly on a wide and stable rim with just tiny and brief slips…….and able to extend a hand to those who are hurting and struggling. Pat, thank you so much for this comment. Your description of grief is beautiful and so accurate. The Compassionate Friends is such an amazing group. I went for quite a while, but then got busy with life and school. I just recently started going back. I’d forgotten how wonderful it was to sit in a room with people who know exactly what you are going through. Being understood in your pain is an amazingly powerful healing tool.